The world of blogging has given me the opportunity to meet so many great people via email and blog posts - however, over night I learnt that one of my old colleagues from when I worked in Washington is now blogging too! I am so excited, so I would love to introduce you all to Mrs O Knows! And let me tell you Mrs O definitely knows! Her creativity is mind blowing, understanding of how children work is phenomenal, her classroom is oh so beautiful and of course she is just a fabulous person! Already on her blog she has shared some fabulous ideas - I can't wait for more!!!! Please show her some bloggy love by visiting her blog and TpT store and leave her a comment or two and some feedback! It is so hard to get started and get your name out there to people, so in fact I would love to help speed the process along for Mrs O! Here is your chance to get a FREEBIE! Simply visit her blog or TpT store and become a follower and I will let you choose any item $2 or under from my TpT for free! (Just leave me a comment on this post with your email address and your choice of freebie after you have visited Mrs O and I will get it to you as a HUGE thankyou!) Comments and feedback for Mrs O would also be appreciated, you all know how hard it is to get started! Thanks Judith! Are there any activities on my TpT you would like? Let me know - I've got some new ones to load in the next couple of days also so you can hang out! Just checked out Mrs O's blog, love her polka dots. Thanks Tania! Are there any activities on my TpT you would like? New ones to be loaded soon if you want to hang out! Hi! I found you through EducatorsLife and what a surprise, another 3rd grade teacher that is passionate about Math!! I would love to just teach math from grades 1-3 and have a Math lab! Within the first week of school I poll my students on their favorite subjects and we collect the data to make graphs. Sort of an assessment to see if I can try a coordinate grid on them too. I love the challenge given to me when students say they hate Math. I have a couple of copies of this activity for grade 3. Looking at the upper elementary format gave me the idea to change it up after certain lessons are completed. Math vocabulary is something I would like to add to it also. I like Mrs. O's ideas on how to use this. I wouldn't have thought of using it for reinforcement in small groups. Thanks for getting my gears in motion! I would love to know more information about your Math Lab! Do you have a blog I can follow? I love the challenge of always making maths fun! I'm glad Mrs O could help out! Don't worry at all about being long - chat with me anytime!!!! P.S. Are there any items you would like from my TpT store? If so, can you also pass on your email address? Thanks! That was a surprise, I was just emailing you. I don't have a Math lab but said I wish I had one. As for my own blog, I'm afraid not, maybe after a year of getting used to the teaching blog community. Check your email, I have a bit of information I would like to pass on. Hi Allison! I just popped over after finding your blog through your comment on mine! 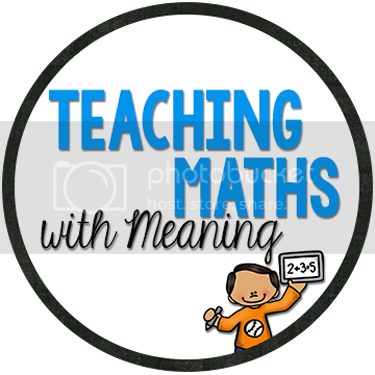 Your blog is lovely and I'm so happy to find one with math ideas! We are implementing new common core standards here in many states in the US and my team is scrambling a bit to adjust! I use a number of the day activity as well where my second graders have to write the value of each digit in a 2 or 3 digit number, write 10 and 100 more and 10/100 less. 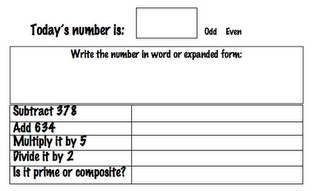 Then write the number in expanded form, word form and draw a model with base ten block shapes. Thanks so much for sharing your ideas! I'm your newest follower! Thanks Linda! I look forward to following your blog also!